Struggling to synchronise a lunchtime slot, Andy suggested another pre-pingpong high tea rendezvous (cf Morrison's). Half decent idea but where, oh where, is Kipper's Bear? Last minute text: he's on the 6:40pm shuttle, the AndyBus, from Adastral to town. QED, cogito ergo sum, choice of location resolves itself. Allons-y a la gare. Head into the station shortly after seven of a Tuesday and you're swimming against a tide of disgruntled commuters squeezing through the bottleneck of the auto-fascist ticket barriers. 'Scuse me, Mr Guard, can I get a coffee from the platform? Phew, I'm through. There, in what they used to call the buffet -- current nomenclature Upper Crust -- is Freddy Folding-Byke himself. 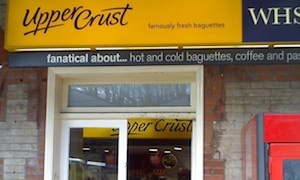 He's scanning the surprisingly good choice of "famously fresh baguettes" and goes for the alliterative chicken, chorizo and chilli. Fresh enough, is his verdict. To preserve my own domestic bliss, I've already eaten, hence straight to sweet with a non-shrink wrapped banana muffin (had worse) and a latte (ditto). Handy Andy kindly flashes his Bitesize card to save us both 20% and make those prices a tad more reasonable. All change since I was last here, what with sofa-type seating at one end, a mini WH Smith at the other, plus assorted fruit machines and a bar (like Jack's). There's even some of that there WiFi if you're in the BT OpenZone. Not wishing to short change those Crusties, I went back for savoury ... on Thursday lunchtime. Ignoring the sarnies, Ginsters and ready-to-toast paninis, receipt reads: "Chicken BcnClub 3.99, OJ Tropcn 250ml 1.80, Red Sky SaltVing 1.00, subtotal 6.79". Wot no Bitesize card to ease the pain. Baguette is good 'n' crunchy. I want to remember every minute, always, always to the end of my days. Hang on, that was Celia Johnson in Brief Encounter. And I don't think she was referring to the refreshment room at Carnforth Station. If it was a car -- LTI TXII. If they were passing by -- Bertrand Baguette.